Remember that critter in your backyard that you just couldn't identify? 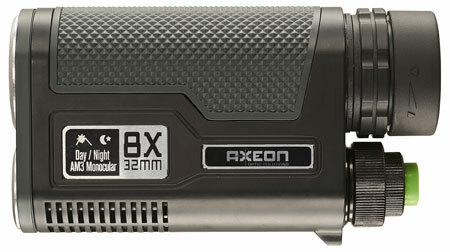 The Axeon AM3 HD Monocular helps you identify those pesky night dwellers. It combines an eight power monocular with a 250 lumen LED flashlight. The compact, durable housing contains an 8x32 monocular with a multi-coated, camera-quality objective lens and a 250-lumen flashlight with spot to flood adjustment. The AM3 is small enough to keep it in your pocket, hunting jacket, or hiking pack so it's always ready. The combination of an optic and a light is convenient and eliminates the need to carry a separate light in addition to a night viewing optic. It's handy, lightweight, and water-resistant. The AM3 "monoculight" is the perfect companion for hiking, sports, travel, concerts, bird watching, sightseeing, hunting and stargazing. It also comes in handy when you want to see what kind of critter is getting into your trash!